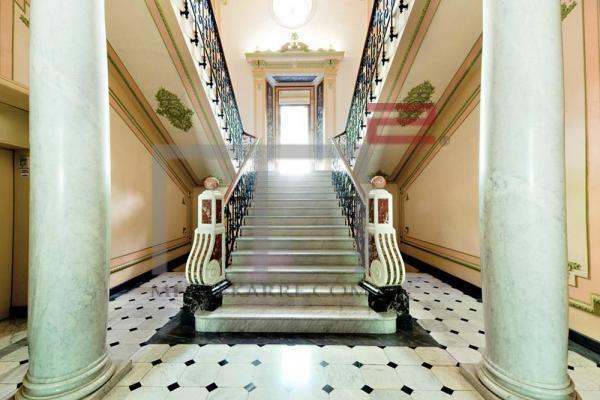 The villa, built around 1880, has been completely restored in all its parts with great care and divided into 10 apartments. The apartment is located on the third floor above ground (reachable by a master lift) and also includes the tower of the villa. Large entrance with wall-hung wardrobes. Living room with mobile wall and large sliding door in satin glass and decorated, lockable to prevent the view. Furniture with lacquered furniture and shelves in "Corian" of Dupont. Large living area with four windows and full sea view. Terrace of 30 sqm. with panoramic views of the sea and hills behind. Sleeping area: double bedroom with built-in wardrobe, sliding doors; exit on the comfortable balcony attached to the room, equipped with a small service room for methane boiler (for hot water and heating). Large master bathroom with two washbasins, tub with shower system, mirror cabinets. Guest room bed. Upholstered wardrobe, desk for two people in white and leather. Bathroom with shower. Study hall entirely flanked on three sides (east, south, west) with extraordinary panoramic views. Two large armchairs / beds. Large mirror cabinet. Bathroom with shower and wardrobe. Mezzanine with single bed and small desk. Ceiling with important wooden beams. All the floors of the apartment, except the bathrooms, are in wood. The wood used is peach pine and teak with decorative inserts. Tiled cellar with elevator on the floor. Park. A car park with possible parking space in the garden. Distance to sea and walking beaches: max 5 minutes. Living room with fireplace and balcony, kitchen, bedroom with balcony, additional bedroom, bathroom. 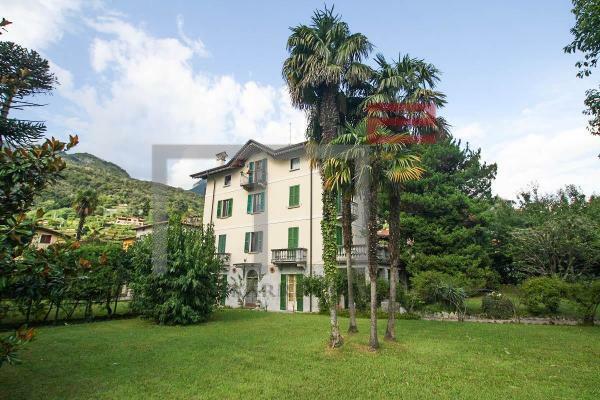 Menaggio, Lake Como, splendid apartment in epoch villa in excellent conditions. Entrance hall, living with pretty fireplace, kitchen, bathroom with bathtub and balcony, double bedroom with balcony, bedroom, technical room with washing machine. Menaggio, Lake Como, modern villa with amazing views over Lake Como and Bellagio. Living room, kitchen, bathroom, 4 bedrooms with en suite bathroom, terrace, large solarium. First-class facilities, underfloor heating, air conditioning, home automation system. Private garden, swimming pool, garage. Lake Como, Tremezzina, Lenno village. We offer for sale a two-storey apartment in a well-maintained complex with a swimming pool with a terrace overlooking the lake. On the second floor there is an entrance, a hall, a living room with a kitchenette, a bedroom, a bathroom with a shower, a small room with a wardrobe and a pantry and access to a balcony, a terrace overlooking the lake and mountains. In the attic floor there is another bedroom and a bathroom with a bath. The apartment is recently built, in good condition, with new high quality furniture matched with taste and attention to details. To the shore of the lake and the city center with a promenade, a boat station is only a few hundred meters. There is a supermarket nearby. The apartment is ideal for those who want to move on foot. Great potential for renting for weeks to tourists. Lenno is one of the largest cities on the western shore of Lake Como. The city is famous for its villa museum of Balbianello, a long promenade along the lake with bars and restaurants. Here goes the walking route "Green Way del Lago".